Previously TexasGOPVote reported on State Representative Allen Fletcher's bill (HB 3094) to increase the fines on trucks that run overweight loads that are destroying our roads and highways. Recently the Texas Senate passed and forwarded on to the House for consideration, a bill (SB 1671) by State Senator Robert Nichols. The Senate bill is now before the House Transportation Committee, chaired by Rep. Larry Phillips (R-Sherman). The bill increases the current fines against truck drivers and companies that are carrying overweight loads that are now so low as to not be a disincentive at all. The bill creates no new regulations on businesses. The goal is to put some teeth into the law and encourage more rigorous enforcement. 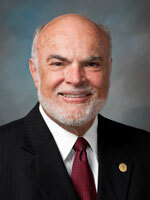 Sen. Nichols said, "The current penalty structure rewards dishonesty. There is an economic advantage to operating without a permit. The purpose of SB 1671 is to increase penalties to the point we no longer encourage bad behavior, but incentivize individuals to comply with the law." This raises an interesting question however. Sen. Nichols' bill carries an exception for certain kinds of trucks - ready mix trucks and gravel trucks. It begs the question - How did that happen? Sen. Nichols bill reduces the fine proposed for these particular heavy weight trucks by nearly two thirds, down to $150 compared to other trucks running overweight loads. Don't we want to incentivize these truck drivers to comply with the law as well? Or is it okay because a concrete truck running 10,000 pounds overweight does less damage than say an oilfield equipment truck running 10,000 pounds overweight? Perhaps it is just another example of the political influence of special interest groups that don't care about your decaying highways. It will be interesting to look into this further and dig for the motivation for this special treatment. Time is running short for this legislative session. How much more damage will be done to our roadways if we do not get a bill passed to address this budgetary and safety problem? Let's hope the House and Senate can get together and resolve this issue before the clock runs out.